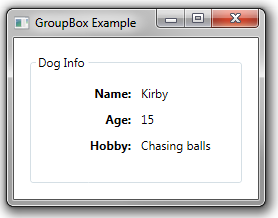 GroupBox is a control that draws a labeled border around a single child element. Being a content control, it can contain at most one child element, but the child can be a panel control which in turn contains a number of other controls. The GroupBox is typically used to show visually that a set of child controls are related. The example below shows a GroupBox that contains a Grid as its child element. The Grid then contains some Labels.